Plum Blossom Stick is one of Shaolin stick.The stick is a Shaolin monk soldiers use most, one of the most conventional weapons. Shaolin monks at the stick, the world knows. 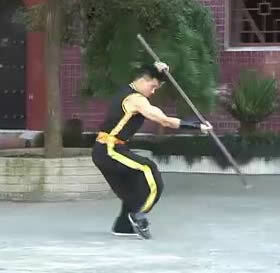 So that the words of Shaolin martial arts, will be called Shaolin staff. Shaolin cudgel not only by Shaolin monks as "hundred soldiers Zu", the society also put Shaolin cudgel is called "the art of cases". In the history of the formation and development of Shaolin martial arts, Shaolin staff plays a decisive role in. Stick a large, sweeping away the body to a split. Stick to practicing the wind whistling, rhythm and vivid, his dense, fast fierce. It not only can improve the health, but also can vanquish the enemy, the enemy in the past dynasties, Shaolin cudgel play an important role.